Color is one of the fundamental properties that define all matter. It is the selective absorption of some electromagnetic wavelengths and the reflection of others that give all matter its characteristic color. The absorption and reflection of electromagnetic radiation occurs at the molecular level and it spans wavelengths that extend beyond the visible spectrum. Monitoring these visible and invisible wavelengths provide insights into a material's chemical composition. One area where these principles are finding an important application is in the remote sensing of the visible and near-infrared radiation reflected by cultivated crops, forests and other eco-systems. Changes to any of the reactants on the left side of the equation impact the equation's products on the right. Monitoring the radiation that is reflected by a plant provides insights into how efficiently it is carrying on photosynthesis and so, into its general state of health. Photosynthesis occurs in specialized chlorophyll-containing plant cells called chloroplasts. These cells are most abundant in plant leaves. During photosynthesis, they absorb blue and red light and reflect green light so chlorophyll-containing leaves appear green in color. If the number of chloroplasts should change, the amount of red radiation that the plant absorbs decreases. As plants die, they began to brown. The amount of red radiation that they reflect increases. 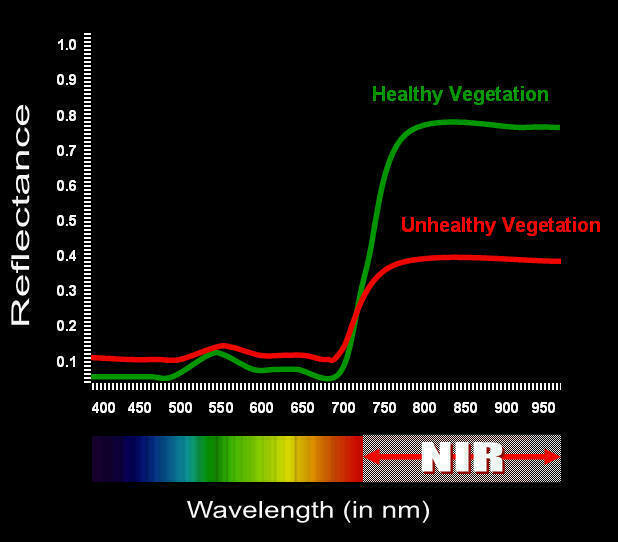 Photosynthetically-active plant leaves also strongly reflect radiation between 700 and 1000 nm in the near infrared or NIR portion of the spectrum. If plants are stressed, the amount of NIR that plants reflect decreases. In multispectral imaging systems, the ratio of reflected near-infrared radiation to red radiation is used as an excellent indicator of plant stress. In order to view normally invisible near-infrared radiation in a multispectral image, a false-colored image is created. In this, near-infrared radiation in the scene is displayed as red in the image. Red in the scene is displayed as green and green is displayed as blue. 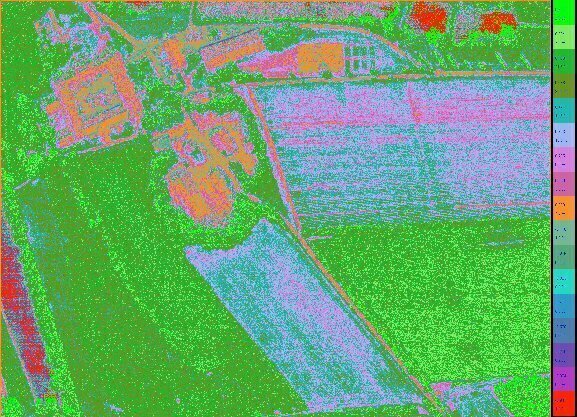 In a multispectral image of a farm such as the one below, strongly-reflected near-infrared radiation that is converted to red mixes with reflected green radiation that is converted to blue creating a reddish-tinted magenta mix everywhere that photosynthetically-active vegetation is present in the image. Viewing the equation, it is evident that when the amount of detected red at a particular pixel position in a multispectral image approaches zero, the NDVI value of that pixel approaches plus one. When the amount of detected NIR radiation at a particular pixel position approaches zero, the NDVI value of that pixel approaches minus one. Consequently, NDVI is an index that varies from plus one signaling the presence of lots of vegetation at a pixel location to minus one signaling no vegetation. Tetracam cameras include PixelWrench2 software that enables users to extract and display vegetation indices such as NDVI in palletized color-coded images. These provide excellent indicators that clearly show everywhere in an image with values that approach plus one (where photosynthetic activity is taking place), everywhere in an image with values approaching minus one (where there is a lack of photosynthetic activity indicating unhealthy plants or inorganic matter) and everywhere in between. NDVI images quantify concentrations of vegetation on a per pixel basis. For ease of use, PixelWrench2's NDVI images show the user-defined color codes and the total percentage of each color in the image in an adjacent legend. Monitoring NDVI values week after week enables users to easily spot changes and rapidly react to conditions that threaten crops before they can cause widespread damage. In addition to highlighting unhealthy vegetation, NDVI images enable growers to estimate how much living vegetation or biomass is present in a particular area, how productive their crops are, the amount of chlorophyll and sugar that is concentrated in their leaves and the yield they can expect at harvest time. In addition to chloroplasts, chromoplasts represent another specialized type of plant cell that interacts with specific wavelengths in the electromagnetic spectrum. Chromoplasts synthesize and store pigments such as orange carotene, yellow xanthophylls, and various red pigments. The color of the chromoplast varies depending on the pigment it contains. Like chloroplasts, these cells also impart colors to the parts of the plant that contain them. Chromoplasts are present with chloroplast cells in leaves, fruits, flowers and some roots. As the ratio of chloroplasts to chromoplasts changes in a plant structure, that part of the plant changes color. It is the increase in the number of chromoplast cells to chloroplast cells in a lemon, for example, that is responsible for the fruit changing color from green to yellow during ripening. As a plant undergoes changes due to changes in the seasons, it is the changing ratio of chloroplast to chromoplast cells that is responsible for plant leaves changing color from green to red, orange or yellow. Viewed from the air, visible plant canopies are dominated by the spectra of their leaves and because all plant leaves are made of the same basic components, their spectra appear very similar. All chloroplasts absorb and reflect similar wavelengths of radiation. The number of chloroplasts present in a plant leaf, however, does vary as does the amount of photosynthesis carried on by different plant species or by healthy and stressed plants or by the same plant species at different stages of growth. This changes the brightness or intensity of the radiation that is reflected back to a multispectral camera at various wavelengths. Spectral libraries and research papers often show differences in spectral reflectance curves for various plant species such as the graph shown above for spectra gathered around Mammoth Mountain, California from an article at: https://www.llnl.gov/str/May03/Pickles.html. Rather than monitor a broad range of wavelengths in the visible and NIR portions of the spectrum, some multispectral imaging systems such as Tetracam's Micro-MCA allow users to specify particular narrow bands of wavelengths for their cameras to capture. Micro-MCA users do this by selecting specific spectroscopic bandpass filters to place in front of the camera's image sensors such as those filters available from Andover Corporation. Selecting wavelengths that will best accentuate differences between plant species enables Micro-MCA users to distinguish those species in a forest or field or to spot a particular invasive species. By changing filters, the same Micro-MCA might be used to indicate differences between stressed and healthy plants of another species or to track different stages of growth of still another. Micro-MCAs may also be used to indicate the presence or absence of a specific chemical compound such as nitrogen identifiable by its own unique spectral signature. Performing this last function, a Micro-MCA camera might be used to expose inconsistent application of fertilizer in a field or to spot the presence of fertilizer in the wilds signaling planting of an illegal crop. This database lists links to reference articles that are accessible via the web that illustrate how multispectral systems have been used in the past with a variety of crops or for other special purposes. The articles are listed by the crop or application that they discuss in alphabetical order in the index at left. 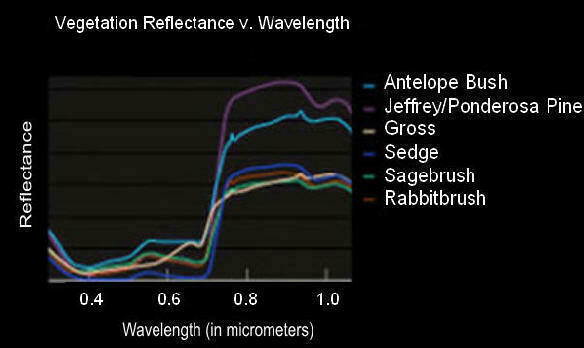 Many of these provide spectral reflectance curves for the vegetation they describe. Many also show additional references on the subject or related subjects at the end of the article. Spectral libraries of vegetation are also available in published texts such as "Hyperspectral Remote Sensing of Vegetation" by Drs. Thenkabail, Lyon and Huerte. The USGS maintains an extensive online spectral library of minerals, man-made materials and some vegetation. Some colleges and private companies also maintain spectral libraries that are relevant for growers. Bio-Rad Corporation, for example, provides a purchasable list of spectral reflectance curves for pesticides and agricultural chemicals. Each of these spectral libraries is shown in the index at left under the heading "Spectral Library." Tetracam produces two families of multispectral imaging systems. The Tetracam ADC (Agricultural Digital Camera) family includes four camera models: the ADC, ADC Air, ADC Lite and ADC Micro. The ADC is designed for hand-held operation. The weatherized ADC Air is designed for carrying aboard manned aircraft or placing on terrestrial platforms or towers exposed to the weather. The 200 gram ADC Lite and 90 gram ADC Micro are designed for operation aboard unmanned aerial vehicles. Each of these systems contains a single high-resolution image sensor that enables users to capture green, red and NIR radiation and, using PixelWrench2, extract vegetation indices such as NDVI. The Micro-MCA (multiple camera array) family of cameras contains 4, 6 or 12 cameras in each system. Each camera is equipped with its own high-resolution sensor that is fronted with a user-changeable filter. Micro-MCAs can perform all of the same functions that the ADC family can, if desired, but they can also perform other specialized functions with selection of an appropriate narrow band filter set that will expose one or more specific spectral signatures or enable extraction of more specialized vegetation indices. The ADC-FX (ADC Filter Experimentation camera) is a hybrid between these two families. Like the Micro-MCA cameras, the ADC-FX enables users to choose specific narrow-band filters (in this case one at a time) to experiment with in order to see how each filter affects images of specific subjects. More information on individual Tetracam multispectral imaging systems may be viewed by clicking on the desired camera model below. For additional information on how our products might be used for your particular application, please contact our Sales and Marketing Department by sending email to sales@tetracam.com If you have an online article that you would like to add to our Multispectral Crop and Application Database, please send it or its url via email to this same email address.